It is quite true that today's generation of lifeboats are a world away from the lifeboats of the those when the Rohilla was lost. Only in the later part of that time were motor lifeboats being introduced. Many believe that it was the Rohilla tragedy which spelt the end for the rowing lifeboat at Whitby enforcing the need for a motor lifeboat. Indeed had a motor lifeboat been more readily available when the hospital ship aground more lives might well have been saved that tragic weekend. Whitby Lifeboat Station currently has a "Trent" class lifeboat was integrated into the RNLI fleet in 1994, it shares the same hull shape as the Severn class but has a smaller topside structure. The sheerline of the lifeboat sweeps down from the bow allowing the easier recovery of survivors. Like the Severn, the lifeboat propellers are protected so it can approach fairly shallow water without damage. The present lifeboat "George & Mary Webb" is kept afloat and was dedicated in 1996. To date the lifeboat has been launched over 250 times and saving over 21 lives in the process. Like the Severn, the lifeboat propellers are protected so it can approach fairly shallow water without damage. 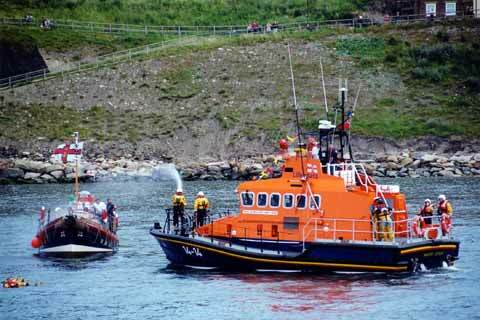 The present lifeboat "George & Mary Webb" is kept afloat and was dedicated in 1996. 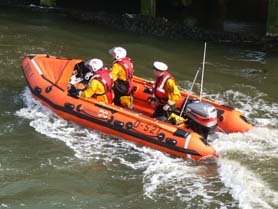 To date the lifeboat has been launched over 250 times and saving over 21 lives in the process. As well as the all weather lifeboat Whitby also has an inflatable inshore lifeboat, called "OEM Stone III" pictured to the right during a lifeboat weekend display, the lifeboat was officially named in September 2007 by the Duchess of Kent. 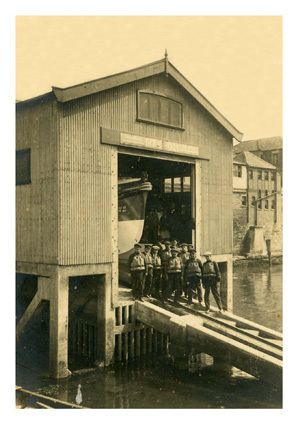 The following link introduces a page holding photographs of a number of different boats that have served as Whitby Lifeboats throughout its 200 year history. The station at Whitby has a remarkable history bravery with 49 awards for gallantry being presented, sadly the station has also seen enough tragedy with five lifeboat crew losing their lives whilst saving others at sea. The RNLI is not government funded and is totally reliant on funds raised by generosity, along with annual lifeboat weekends each station organises fundraising ventures aimed at raising the much need funding. The old station built in 1909 (seen left ), has served Whitby well but a new fully dedicated station was needed, the old station was not suitable for providing today's generation of lifeboat volunteers with all the facilities one would expect. 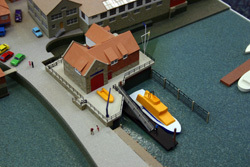 A state of the art station destined to serve generations of lifeboat crew was designed and fund raising began in earnest. 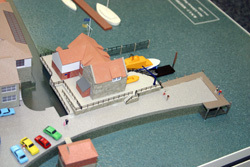 The photographs below were taken from models presented as part of the planning and fundraising stages yet they are very accurate. I have great pleasure in announcing that I have finally completed the long overdue pages detailing the naming of the new inshore lifeboat and the dedication of the new lifeboat station along with a number of comprehensive gallery pages. Friday the 7th September 2007 began as a wonderfully warm sunny day and the visit by HRH Duchess of Kent to officially open the station was a glorious affair and a day that heralded a new era for Whitby Lifeboat Station.